January 3, 2016 - The Cochise County Sheriff Office returns to the sky after the crash of the departments helicopter on New Years Eve in 2014, that killed the pilot and his passenger. “It’s nice to be back in the air” said Sheriff Mark Dannels. On December 31, 2014, Cochise Sheriff's helicopter, Cochise One, a Bell 206 helicopter (N57AW) had departed VFR from Glendale, Arizona for Sierra Vista, Arizona. The helicopter was being flown to Sierra Vista for maintenance. The Bell 206 was piloted by retired Glendale Police Officer, Jeff Steele, his passenger, a pilot rated mechanic, Mark Hansen were killed when Cochise One collided with the terrain about 7 miles west of Benson, Arizona. At that time, Airwest Helicopters, the operator of the helicopter had notified Cochise County Sheriff that the helicopter had not arrived to the airport and that the helicopters Sky Connect Tracking System was indicating the helicopter was at a stationary location between Tucson and Benson. The Cochise County Sheriff located the helicopter wreckage which was broken into multiple pieces along a 174-foot-long debris path about 8:30 PM. Witnesses living near the crash site reported hearing a low flying helicopter at the time of the crash, and that the visibility at ground level was limited, with low clouds and fog. 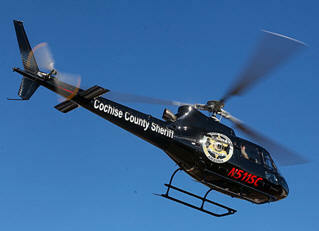 Cochise County Sheriff Office made their first flight since the fatal crash that happened a year ago. On Friday, New Years Day, with little fan fair, pilot Mitch Kelldorf took off from Sierra Vista airport for the Department's inaugural flight in a Airbus AS350B2 (N511SC) helicopter. In a brief ceremony before the flight, Sheriff Mark Dannels, Kelldorf and Commander Mark Gentz offered some brief comments. Dannels said as a result of the crash and a complete review, his department has come up with policies and training programs that offer better safety procedures. Gentz xpress the Departments thanks to the the Cochise County Board for their support and to the Howard Buffett Foundation for its $1.5 million grant which will pay all costs associated with the one year operation of the helicopter.